Being the first author interviewed for a site that has yet to be created is a daunting task, but Stephen Elliott was up to it! 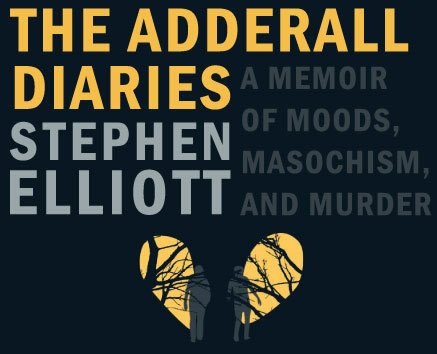 Stephen’s newest book, The Adderall Diaries, came out in September of 2009. We are forever in debt to this great author and really cool guy, for our first 20 Questions With Mourning Goats! I think of that movie, The Men Who Stare at Goats. I never saw it. 2. In 2008, you started The Rumpus, what has it taught you about writing, life, etc.? The main thing it taught me is the importance of community in relation to art. People, especially in the current, fragmented environment, want to be able to share the experience of art with others. I hadn't realized that before. 3. Also, with The Rumpus, you’ve started branching out with book clubs and daily emails, where do you see the website going? Those are the two biggest things. The Daily Emails were supposed to just be links to interesting content but then I started adding my thoughts and eventually they became mini-essays, exercises in creative non-fiction, literary and very personal. People would sign up for the list and receive 2,000 word monologues on love and politics and everything else. About two months ago we finally changed the site so it reads "Sign up for The Daily Rumpus and receive overly personal emails" so at least now people have a better idea of what they're getting. But the thing about the emails that was surprising to me is how fulfilling they are. I really enjoy writing them. For a long time I would feel guilty because I thought I should be working on a book. Now, when people ask what I'm working on I say email. It's the bulk of my creative activity, and I'm fine with that. It's kind of new and exciting, actually. As for the book club when we had the idea to start a book club and charge $25 a month we thought we would have twenty members but right now we have about 540, 440 in the regular book club and 100 in the poetry book club. It's changed everything. It's the main thing funding The Rumpus which two people work on full-time (myself and Isaac Fitzgerald). The book club makes me very hopeful about reading. 4. You have seven books so far, do you prefer fiction, non-fiction, or stories? I’ve read that you think non-fiction is harder because you can’t embellish. Do you prefer to write in a specific genre or is there a love for all forms? It's really just about the phase I'm in. Recently I've been missing fiction. There are ways in which the constraints of non-fiction can force you to be more creative, but it's more a mood. The important thing is to reach people, at least for me. To write something couldn't be found elsewhere. There's no point in writing a good book. There's lots of good books. There needs to be more to it than that, either that it's a great book or that it serves and represents and under-represented population. 5. I was a part of your Lending Library, for The Adderall Diaries, where did you come up with the idea, how do you think it turned out, and do you think you’ll do it again? The lending library turned out great. I was able to get 400 people to read The Adderall Diaries before it was released. It was a lot of work, bothering everybody to forward the book to the next reader, etc. I don't know if I'd do it again. I'm the type of person that only enjoys doing something once, then I look for different ways. 6. You’re a very approachable writer, do you have any interesting stories you’d like to share about meeting a fan? Or maybe the strangest meeting?? 7. Most writers have a schedule that they try to keep while writing, and with you doing a daily newsletter for The Rumpus, and your personal life, how do you find time to write? What’s a day in the life of Stephen Elliott look like? The writing I do is for the daily email. That's pretty much all of it. I work on it until about eleven. The rest of the work day is maintaining The Rumpus, or other things. 8. Do you think that the publishing world is prospering from the digital revolution that’s happening right now (everything from facebook, twitter, and myspace to e-readers, iPad, and smart phones)? I don't know. "Publishing world" is a slippery term. Some people are hurting. The writers don't need anybody. There'll always be writers. Literary writing has always been, and always will be, a labor of love. The larger publishing houses might die, and that doesn't bother me except I know some very nice people that work in those places. The majority of people who stay in publishing will do it for the love until they can't anymore. 9. You were a Stegner fellow, without an MFA, bravo! How did that happen and what are your thoughts on the teaching of writing? Anybody can apply for a Stegner fellowship. I have a lecture I give on using your life in your writing. I think it's really helpful for writers. It's something I know about. I don't have much to say about teaching writing. I'm much better at lecturing than I am at leading a workshop. I hate reading students' writing, which is a jerk thing to say, but it's why I rarely teach workshops. 10. What do you think about book tours? You had your own way of doing it for The Adderall Diaries, can you tell us a little bit about that? I'm sure you experienced some pretty bizarre situations. Any list toppers you care to share? My way was basically to say I would read in anyone's house if they promised to get at least 20 people to attend and would let me sleep on their couch. It was really fun, and draining, and when it was all over I kind of had a breakdown that I didn't see coming. There were crazy stories of all the usual types. Mostly it was a much better way to meet people and see places than reading in the big bookstores that tend to be very central. I was able to read in places that didn't even have bookstores and most of the people that attended weren't there for me, they were there because their friend was having a party. The majority of people at these parties had never been to a literary event in their life. It was really kind of amazing. 11. We all write for a reason, hopefully, our readers know that that reason isn’t money. Why do you write? It's what I like to do. It fulfills me and connects me with others. I guess the question is almost, Why wouldn't I write? It's what I've been doing in my spare time for many years. 12. How does a book about writer’s block and getting back onto adderall turn into a memoir, true-crime, substance-abuse, being a writer, and a love story, called The Adderall Diaries? Well, it wasn't a book when I started. I just began taking notes, not worrying about writing a book or publishing, just kind of documenting my life and thoughts. I was trying to get out of my head, and about a week after I started that I heard that Sean Sturgeon confessed to 8-and-a-half murders (he wasn't sure if one of the victims was dead). Sean and I know a lot of people in common and our lives have overlapped in some very strange ways. So I started looking into that. But I still didn't know I was writing a book. 13. I’ve heard in a lot of interviews that you refer to your life as living like a retiree, do you still think that way? What’s the best/worst part of that? What I mean by that is I do what I want, I live the same life I would be living if I was retired and if I had a lot of money I don't think that would change too much. It's nice. I've learned to live on very little money and that's enabled me to not have a job. On the downside it would be impossible for me to support a family without going to work, and at this point going to work is out of the question. 14 .With seven books under your belt, do you get recognized in San Francisco (or anywhere for that matter), when you’re walking? How do you handle being known in that way? Ha. I don't know. Occasionally at a party or something someone will recognize me, most likely because they saw me hosting a Rumpus event at The Makeout Room. 15. I noticed you have a few tattoos, what are they and what do they mean to you? The one on the left arm is a cover up for a "jailhouse" tattoo I got in the group home when I was fourteen. It was huge, crooked dagger. The cover-up is a wizard releasing an orb. It's actually a western takeoff on a traditional eastern tattoo, but it's a greek figure instead of a buddha. On my left leg is The Persistence of Memory by Salvador Dali. I don't know why I did that one. I was in college and hanging out with the local tattoo artist and I said, Why don't you do that on my leg. The band on my right arm is actually a version of the leather pride flag. I got it early in my relationship with my ex-girlfriend, in 2005. I was in love, in that way that makes you literally crazy. 16. Your dad used to write bad reviews on Amazon.com about your books. What’s the story behind this? He still does stuff like that. It's mostly, I think, because he has a version of events that he doesn't think are being accurately represented in my books which frequently deal with my adolescence and time in group homes. Also, parents make a lot of sacrifices for their children, which I think he feels are overlooked in my writing and interviews. 17. You say in a lot of interviews that you stopped taking adderall and had writer’s block. Why did you stop to begin with? Did you think it would have the effects it did? I stopped taking Adderall because I wanted to be healthy and Adderall is amphetamine. I'd had writers block for a while before quitting Adderall. 18. You say on The Rumpus that you want to show people art and culture from people we haven’t heard of, who are some of your favorite unknowns in the literary, art, and/or film, world? I'm really fond of Ian Huebert, Paul Madonna, and Wendy MacNaughton in the art world. Though I don't know anything about art. Some writers that I think should receive more attention include Rob Roberge, Corrina Bain, Michelle Tea, and Bucky Sinister. But really, there's so many. A fair number of people have heard of Steve Almond and Rick Moody but they're both still under-appreciated. 19. If you could give one piece of advice to up and coming writers out there, that you wished you received when you started writing, what would it be? You know, I wonder if such a thing exists. I don't know that I was really open to receiving advice when I was a young writer. I mean, I started writing when I was ten, and I was writing to get things off my chest, to express things that felt dangerous to say. Eventually I started publishing those things. But you're really asking two separate questions. You're asking about advice for people who are starting to write and up and coming writers. If you're just starting to write you're probably ten years away from being an up and coming writer. If you're an up and coming writer I would say, keep the rights. 20. Are you working on anything new that you’d like to tell us about? Just the Daily Rumpus emails. First, I think you need to move ahead one year, September 2010. Other than that, awesome interview. This tidbit is perhaps why I admire Stephen Elliot the most: "I started writing when I was ten, and I was writing to get things off my chest, to express things that felt dangerous to say. Eventually I started publishing those things." We all write for our own reasons, in our own style, and on our own timeline. He gets that. He's always authentic. Those are the authors who succeed. I swear. Excellent interview -- a few steps ahead we often see on the blogs. I'm looking forward to more.